If you are missing one to a few teeth in a row, you may benefit from the lifelike dental bridges available at our Brooklyn Heights, NY, practice. Bridges are custom-made restorations that will replace your missing teeth, enhance your appearance, and renew your dental function. We provide traditional bridges that will attach directly to your teeth, and we also offer highly stable implant-supported bridges. At Dentistry at the Heights, all of our bridges are crafted from high-quality materials. During your consultation, one of our talented doctors will help you choose the right type of dental bridge for your needs. A bridge may be appropriate if you are missing between one and three neighboring teeth. A traditional bridge is comprised of replacement teeth, called pontics, with dental crowns on each end. The crowns are fitted on top of your natural teeth on each side of the gap to secure the bridge in place. In order for your bridge to last, these natural teeth must be strong and healthy. If they are weak, or if your missing teeth are at the back of the mouth without a good tooth on each side, a traditional bridge may not be right for you. Once your prosthetic is in place, you will be able to bite and chew normally, and you can eat all of your favorite foods. An implant-supported bridge looks similar to a traditional bridge. However, instead of attaching to your natural teeth, this type of prosthetic will be secured with dental implants set permanently in your jawbone. Implants must have a sufficient amount of jawbone volume for support. Before recommending an implant-supported bridge, your dentist will examine your jaw to make sure that the bone is strong enough. Fortunately, even if your jaw has begun to recede, we can often restore your candidacy for implants with a bone graft. Traditional bridges are secured by crowning adjacent teeth. What Happens When You Receive a Dental Bridge? Before providing your traditional or implant-supported bridge, your dentist will explain your various treatment options. Bridges can be made from a variety of materials, including metal alloys, porcelain-fused-to-metal (PFM), all-porcelain, or zirconia. Metal and PFM bridges are both strong and economical. However, if you are replacing highly visible teeth, we will typically recommend a modern tooth-colored material. Before placing a traditional bridge, the doctor will numb the treatment area. Then he or she will reshape the teeth that will support your restoration. Your dentist will gently remove a conservative amount of tooth structure, making room for the crowns and creating a strong foundation for the bridge. Next, your dentist will take impressions of your teeth and gums. A dental ceramist will fabricate your bridge from these molds for a precise fit. Once the restoration is finished, you will return for a second appointment to have the doctor attach it. To receive an implant-supported bridge, you will need to have implant surgery. During this procedure, small titanium posts are implanted in your jaw, and your bone tissue will fuse around them. 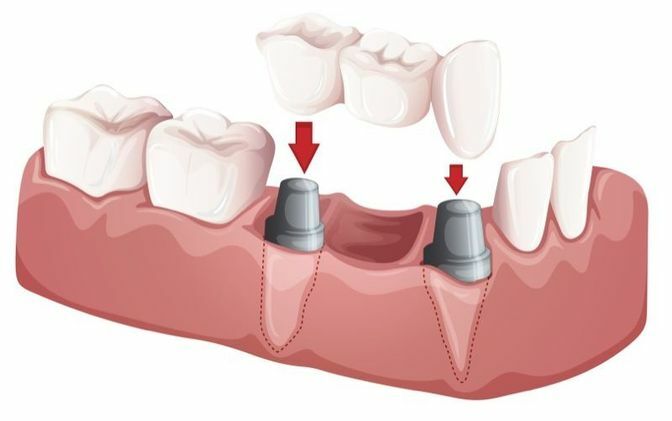 After recovery, a process that usually takes four to six months, your dentist will attach your permanent bridge to connectors (called abutments) on top of the implants. Self-supporting implant bridges do not require crowning teeth. If missing teeth were detracting from your appearance, a dental bridge will make your smile whole again. Replacing the teeth will also fill out your face for a more natural appearance. In addition to these cosmetic benefits, a bridge will restore your dental function. Once your prosthetic is in place, you will be able to bite and chew normally, and you can eat all of your favorite foods. Finally, a bridge can have important benefits for your oral health. By closing the gap in your smile, the restoration will keep your other teeth from shifting out of place. If you receive an implant-supported bridge, you will enjoy additional benefits. The restoration will not require your nearby healthy teeth to be reduced for crowns. Importantly, the implant posts will prevent jawbone recession by mimicking tooth roots, which signals your body to send nutrients to your jaw. Dr. Trotter and the dental team pride themselves on exceeding patients’ expectations in all of their cosmetic and restorative dentistry. If you would like to schedule a consultation to find out more about the different kinds of dental bridges we have available, please contact our friendly staff today.